The systems of teaching-learning in all the departments are backed by Computer Labs designed especially to cater the needs of the students. Built in strict accordance with AICTE’s specifications, the Labs provided to the students, facilitate the access to information highways through Internet. The institute has four air-conditioned computer laboratories with latest hardware and software utilities. The laboratories have printers, which comprise of Laser Inkjet & Dot Matrix Printers. The institute has 225 computers in four labs with most updated configuration and other required peripherals such as printers, LCD Projectors, scanners UPS . 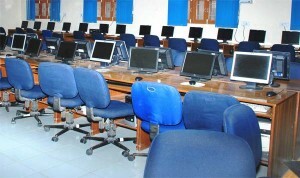 The institute has 2 mbps internet connectivity available in computer lab. An IBM Server that supports a heterogeneous network configured with Windows NT, LINUX and Windows 95/98/2000/Win 7/Win 8.1 Operating Systems. An HP Server that supports heterogeneous network configured with Windows NT, LINUX and Windows 95/98/2000Win 7/Win 8.1 Operating Systems. The Present network has 303 workstations consists of IBM Net vista Machines, HP Brio Machines, HCL, PCS and Lenovo (Think center). CISCO Lab with routers , switches, hub repeaters, Ethernet media with necessary tools for complete CISCO training. Windows NT/Windows98/Windows XP & Windows 2000 Professional, Win 7 , Win 8.1.